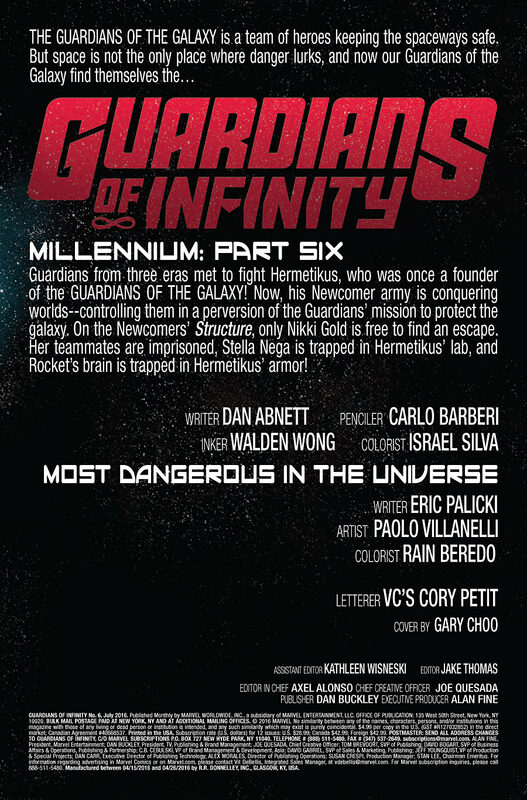 Another issue of Guardians of Infinity and another issue that I only care about the backup story. Knowhere. Formerly attached to a celestial. Currently an interdimensional port of call and sometimes home to the Guardians of the Galaxy. 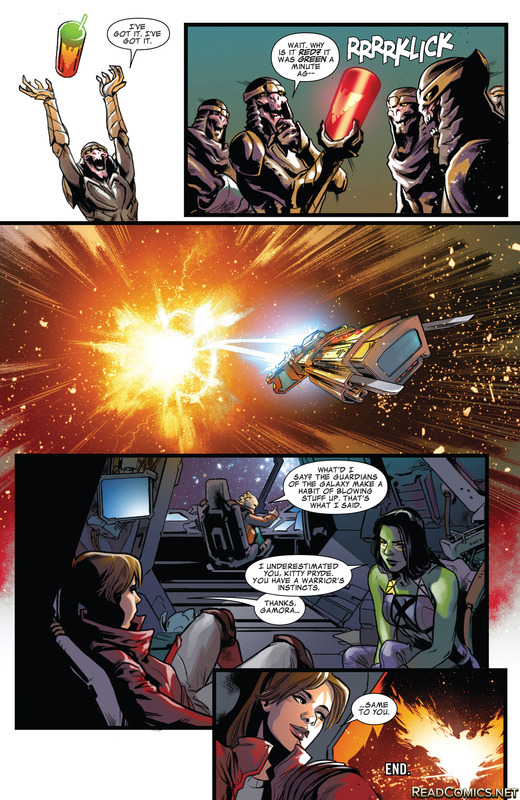 Gamora is trying to get to Maveth and some dumb jerk isn’t giving her his ship. He calls her the most dangerous woman in the universe. Gamora punches D’Clan and takes his ship. We get Pryde, still as Star Lord. 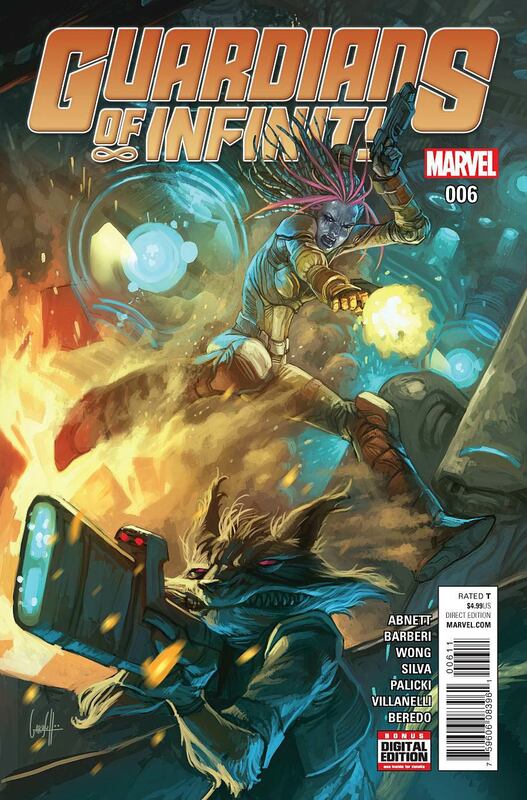 This story treats us to the ladies of the Guardians of the Galaxy and I’m all for it! D’clan’s head is upside down, it was like that before. His chin is on top, then mouth and eyes closer to his neck. That raises a lot of questions! Does he worry about digesting foods and having food fall into his nose? 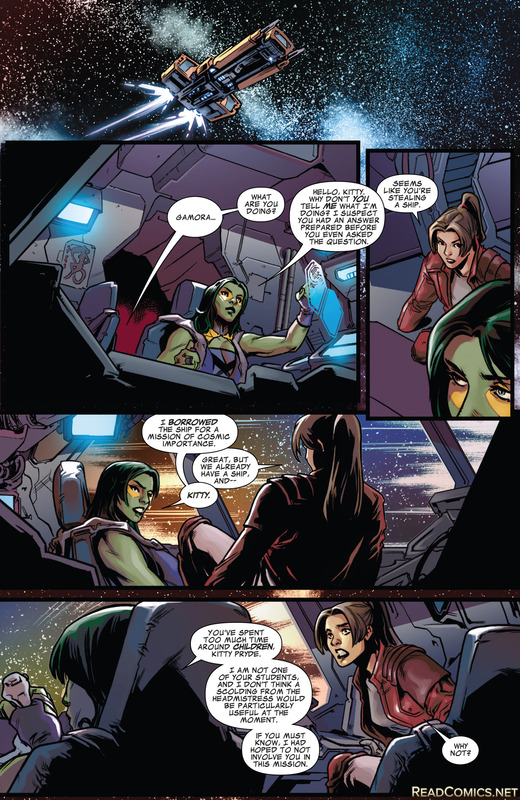 Pryde ovehears how Gamora is heading to Maveth. Pryde somehow got on D’Clan’s ship in time. Pryde is confused as the Guardians have a ship already. Gamora suspects a lecture is coming, as Pryde has spent a lot of time schooling children. Gamora was hoping to spare Pryde this mission. Gamora has taken Pryde to Maveth. 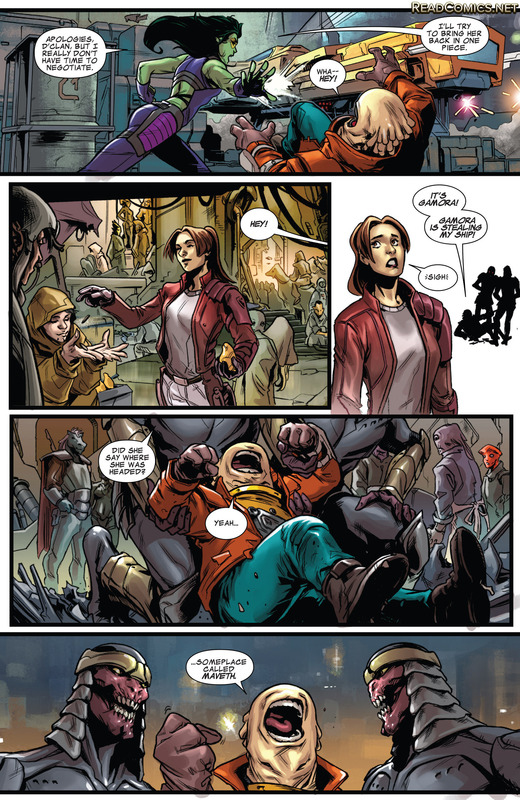 Pryde comments on the intense sandstorm, Gamora tries to correct her that it is a glass storm. 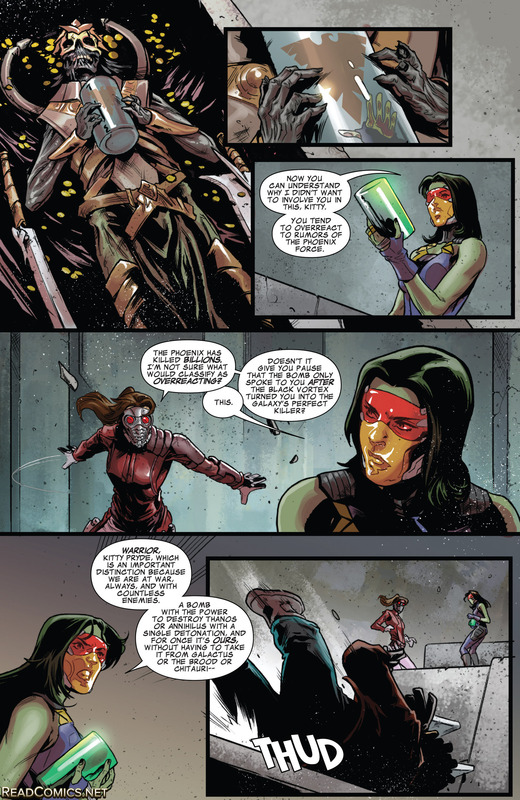 Pryde, being the genius that she is, double corrects Gamora that glass is sand. So Gamora is the dummy there! I like that repeating the panel sequence, but not going lame with it. Gamora was here, once before, with adopted daddy – Thanos. 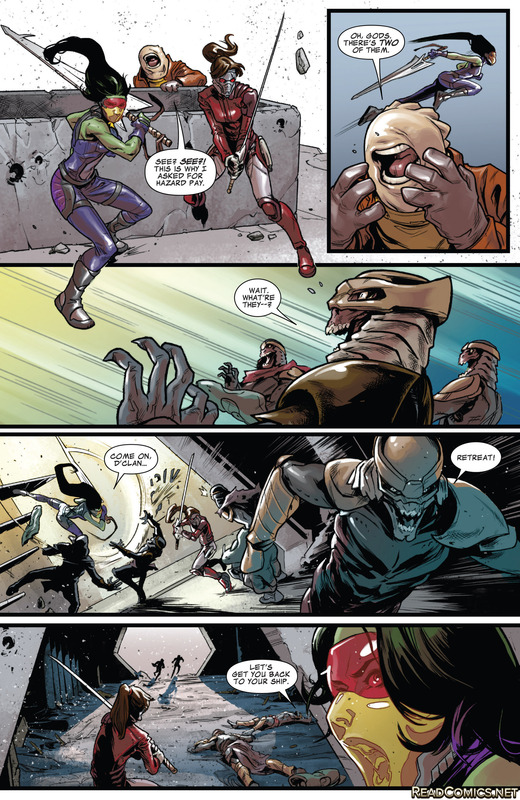 Gamora tells the tale of Maveth, They were a warrior race, that pride themselves on killing each other with better technique – then the bomb came. Now there are no more of them. This occurred a thousand years ago, no one has known the location of the planet. Which is odd as Gamora just said she was here once before. Gamora, after Black Vortex, sensed there was a second bomb on the planet and that sense memory is what she followed this day. The two dames are heading into the structure where their king was buried. Pryde references how kings or emperors would bury items with them, so that they can use it in the afterlife, she suspects that’s what the intention was here. Gamora doesn’t know anything about that, as I imagine she hasn’t taken much interest in Earth. Has she been there often? Not from the year’s worth of stories I’ve read. I don’t believe she was there during Secret Wars 2015’s first issue. The two ladies move the top of the coffin. The emperor is holding onto a canister with the Phoenix Force logo on it. 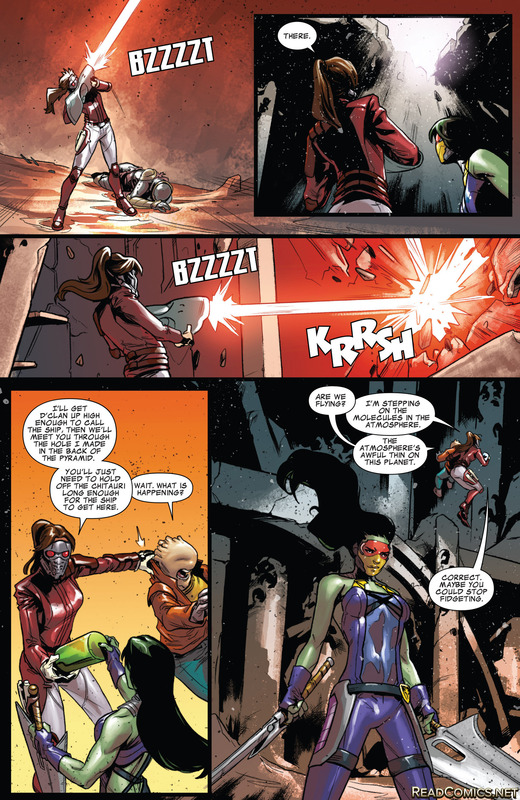 This is why Gamora didn’t want to bring Pryde, as she has a history of overreacting to the Phoenix Force. For perfectly natural and justly reasons. Pryde is offended by that comment. She also doesn’t like that the bomb didn’t speak to her until Gamora was the universe’s perfect killer. 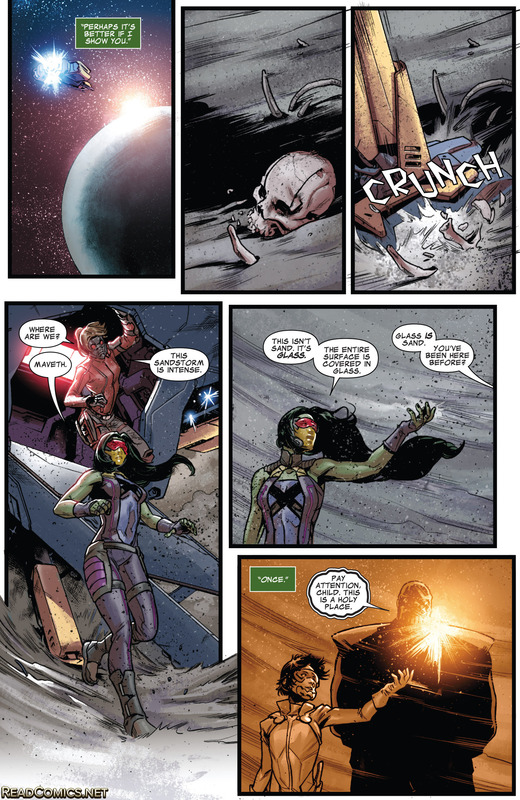 Gamora corrects Pryde, she was the universe’s perfect warrior. These two need to spend more time together. 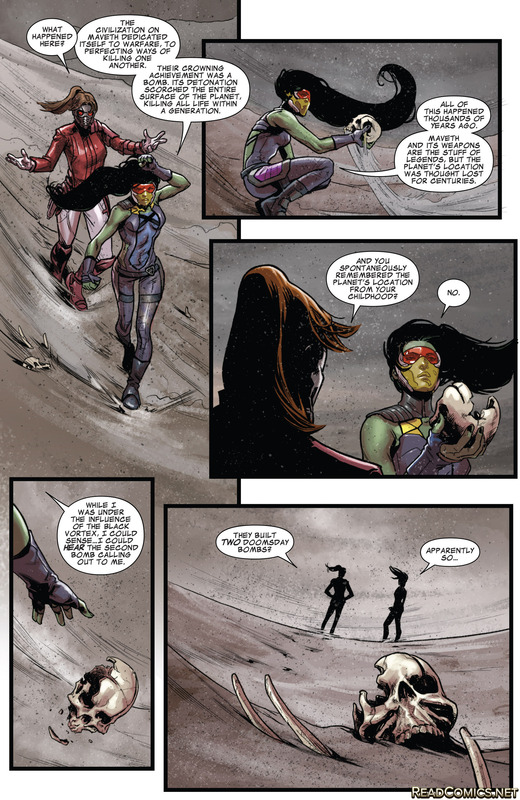 I like, I didn’t pick it up until this late into the story – Gamora always calls her “Kitty Pryde” as if the whole name is her name – which it is. 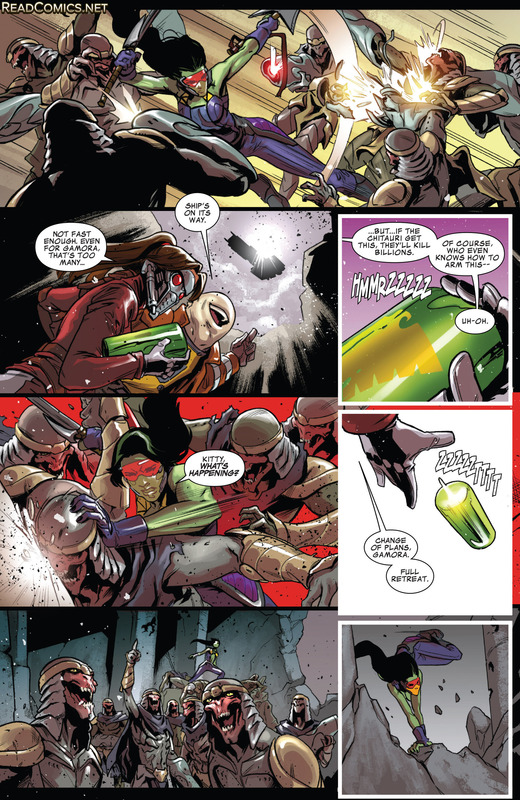 Gamora wants the bomb, to use against the likes of Thanos or Annihilus. The Chitauri followed the two Guardians. For some reason, D’Clan came along – actually, from the art – I’m sure he was forced to come but I’m not sure why. It isn’t like D’Clan knew the location of the planet, he just knew the name of the planet that Gamora was heading towards. Pryde assists in getting these three to safety by phasing through everything. 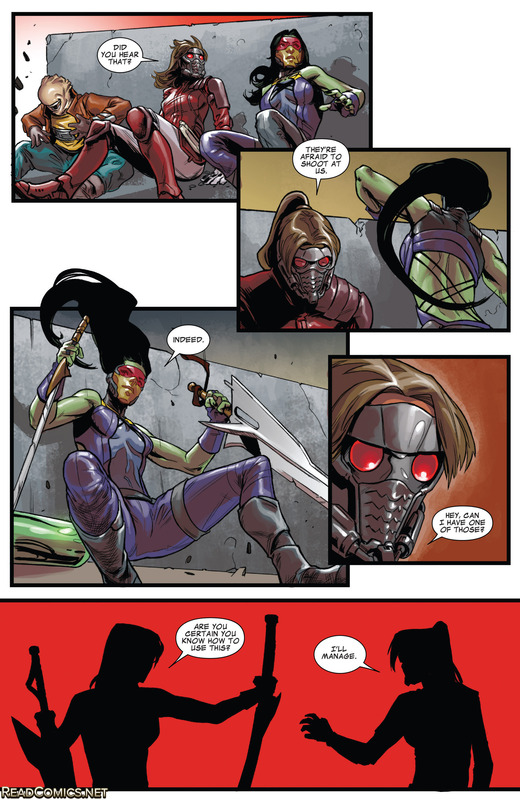 The shooting stops and Gamora pulls out two swords. Pryde wants one of those – which is awesome! 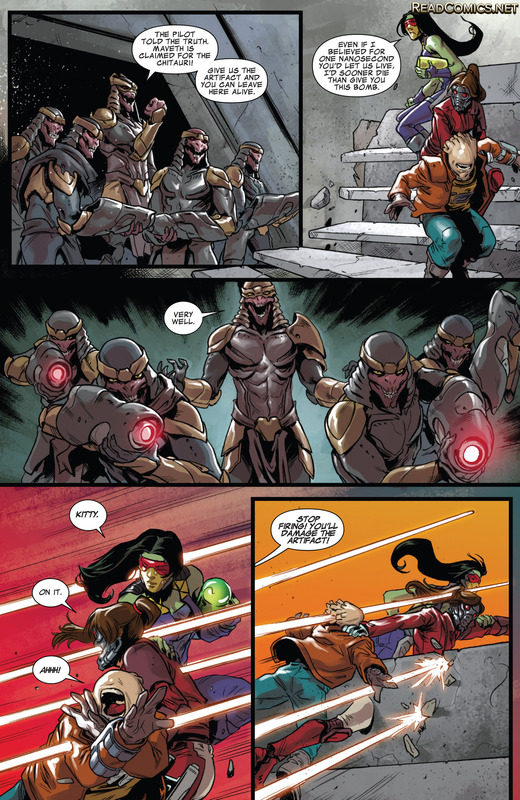 More awesome is that Gamora does give up a sword and the two start attacking the Chitauri. The three of them are going to head for D’Clan’s ship. They need to get to higher ground, Pryde has a plan. Pryde grabs a gun and starts blasting holes. 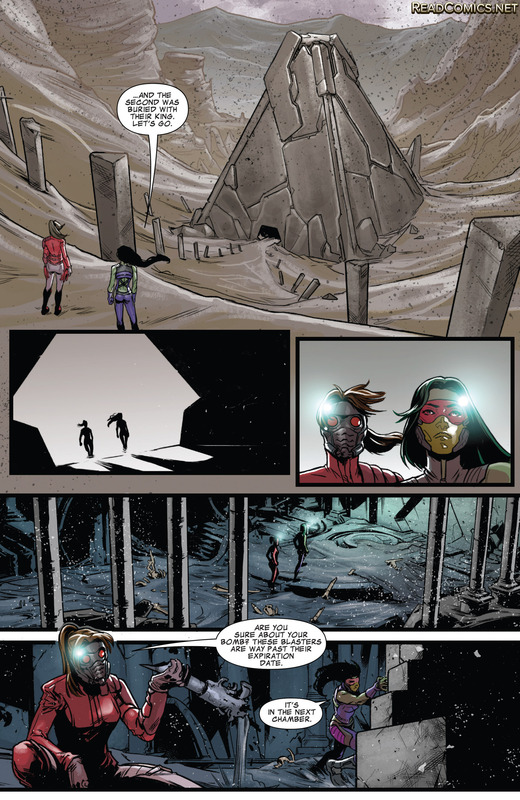 Pryde is going to skywalk with D’Clan and Gamora has to hold off the Chitauri until the ship comes back. I like how Gamora is totally up to the task. The ship is on the way but it is taking too long. While touching the canister, it starts making a wheezing sound. 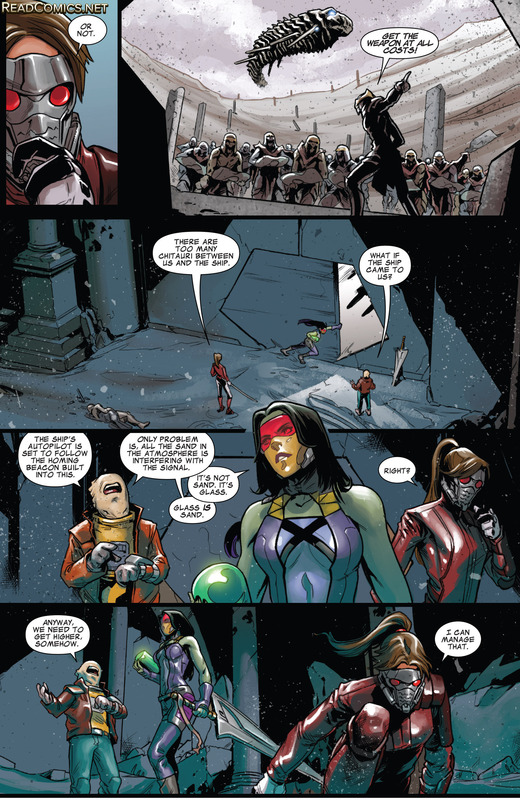 Pryde drops it and shouts to Gamora to retreat – which she does. The canister turns from green to red (of course it does!) and explodes. Pryde just blew up a planet and killed so many Chitauri. She choose to kill hundreds to protect billions. That’s the right call. 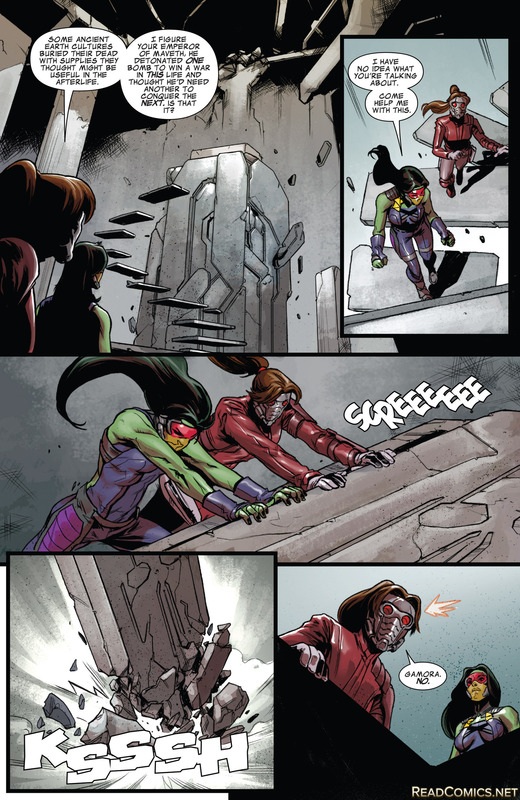 Gamora has so much respect for Pryde’s warrior instincts. I do feel like that is a giant moment for Pryde and should be referenced again as lives were lost there and she wouldn’t take it lightly.